This large, impressive casket has been created by talented artist Kuzmenko Galina from the village of Palekh. 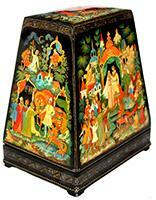 The box's lid and all its four sides show the scenes from Russian folk fairy-tale of a Hump-backed Horse! This tale tells about adventures of the stableman Ivan and his faithful friend the Humpbacked Little Pony who is a magical creature. All the key moments of this thrilling tale are depicted here. On the top of the casket there is a scene from the beginning of the story : Ivan catching the horse that trampled down the wheat field of his father. The horse asks Ivan to release him, and promises to give Ivan two golden-maned steeds of unheard-of beauty and a pony with two humps on its back and yard-long ears. The golden-maned steeds help Ivan to become the tsar's stableman, while the Little Humpbacked Pony becomes his faithful friend. The capricious and self-willed tsar obliges Ivan to carry out very difficult tasks: to catch the firebird, to kidnap the beautiful Tsar Maiden, and to get the Tsar Maiden's ring lost somewhere on the bottom of the ocean. While fulfilling these errands Ivan travels to the Moon's crystal palace to find the reason of the Huge Whale's torture. His back is covered with forests, meadows and villages, and he can't get free. The Moon tells Ivan that the Whale is punished because he has swallowed three dozen ships. Afterwards the Whale lets the ships go, receiving his freedom, and helps Ivan to find the Tsar Maiden's ring. The box's front side shows Ivan's transformation into a handsome man. The Tsar-Maiden has ordered the old tsar to dip himself into three cauldrons of boiling water, boiling milk and ice cold water in order to regain his youth. But the coward tsar, in his turn, orders Ivan to be the first to jump into the boiling water. Having undergone this severe trial, Ivan emerges from the last cauldron as an extremely handsome young man, whereas the old tsar, who also decides to test the magic, is boiled alive. All people of the kingdom welcome Ivan, and ask him to become their tsar. The final episode of the tale is the marriage of Ivan and the beautiful Tsar Maiden. A broad spectrum of colors is used to create this highly detailed world. The artist leaves the sky black, which is one of Palekh's stylistic trademarks, but does not mean that the scene is taking place at night. Gold paint and aluminum paints are used to enhance the life and brightness of the scenes. All the compositions-the top and the sides, are framed with a golden dot ornaments. The base of the box is decorated with gold filigree patterns accented with aluminum paint. The box is constructed from paper-mache. The exterior of the box is painted with black lacquer while the interior is completed with red lacquer. The lid is hinged from the top of the casket, and the box rests on four legs. Under the composition the artist has wrote her name,title and the village of Palekh.